Microsoft's impressive IllumiRoom technology was first shown off at the beginning of 2013. It hooked up to an Xbox 360 and used projectors aimed at the wall behind a TV to expand your games beyond the bezel. It was supercool but never likely to become a 'thing'. Microsoft said as much at the time, but a new video released by Microsoft Research has revealed new developments and a new name. IllumiRoom is now RoomAlive - terrible names both, but RoomAlive does look genuinely cool and a big step forward in technology terms. Instead of bleeding your games from your TV into the surrounding area, it dispenses with the TV entirely and puts you smack, bang in the middle of the game. It uses an array of projectors and Kinects (the Xbox 360 kind) to project a game onto every surface of your living room apart from the ceiling. Kinect's depth sensors scan your walls and floor to measure the geometry of the room and the projectors then use that information to focus their beams. The upshot is that the RoomAlive projections are not just aesthetic - you can now interact with them too. 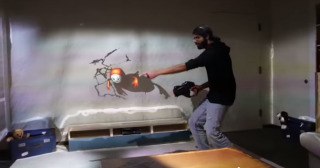 And that makes RoomAlive about as close to a holodeck experience as has ever been created - albeit a low-res two dimensional one painted onto your walls. "RoomAlive is a proof-of-concept prototype that transforms any room into an immersive, augmented entertainment experience. Our system enables new interactive projection mapping experiences that dynamically adapts content to any room. Users can touch, shoot, stomp, dodge and steer projected content that seamlessly co-exists with their existing physical environment." So will RoomAlive ever become a take-home product? Almost certainly not, but Microsoft isn't developing this technology for no reason. While Oculus, Morpheus and the other incoming VR headsets are more suitable 'immersive' gaming peripherals for the home, they're not good at all for shared experiences or group gaming.